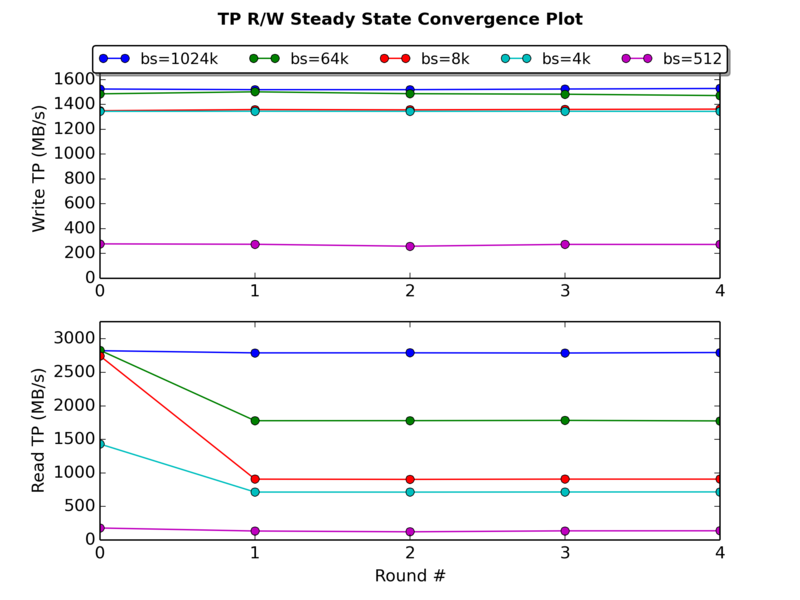 The real world performance of a Flash device is shown when the Steady State is reached. In most cases these are not the performance values which are shown on the vendors website. A device taken fresh out of the box should provide the best possible write performance for a while. Why? 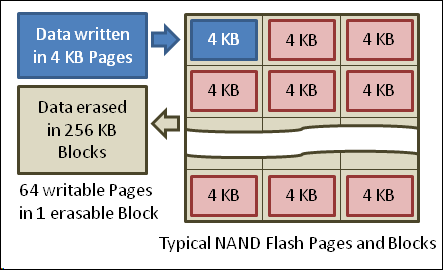 A flash device writes data in 4 KB pages inside of 256 KB blocks. To add additional pages to a partially filled block, the solid-state drive must erase the entire block before writing data back to it. Often when you would like to test a device some data has already been written to it. This means you can’t test the FOB performance anymore. For this it is possible to “Secure Erase” the device. This feature was original introduced to delete all data on a flash device securely which means that all pages/blocks will be zeroed even the blocks which are over-provisioned (not visible to the OS). But it can also be used to optimize the performance and restore the FOB performance for a while. The vendors provide tools for this. Be careful. Some vendors make us of Sanitize and Secure Erase as features. But the implementation is different. So a Secure Erase may only delete the mapping table and not the blocks them self. The transition is the phase between the good performance of FOB and Steady State. Most of the time the performance drops continuously over time and the write cliff appears till the Steady State is reached. Measurement Window,is within 10% of Ave(y) value within the Measurement Window. Basically this means: Use a predefined write/read pattern and run this against the device until the performance of the device will be stable over time. The whole block will be run up to 25 times depending if Steady State is already reached. Each run will be for 1 Minute. 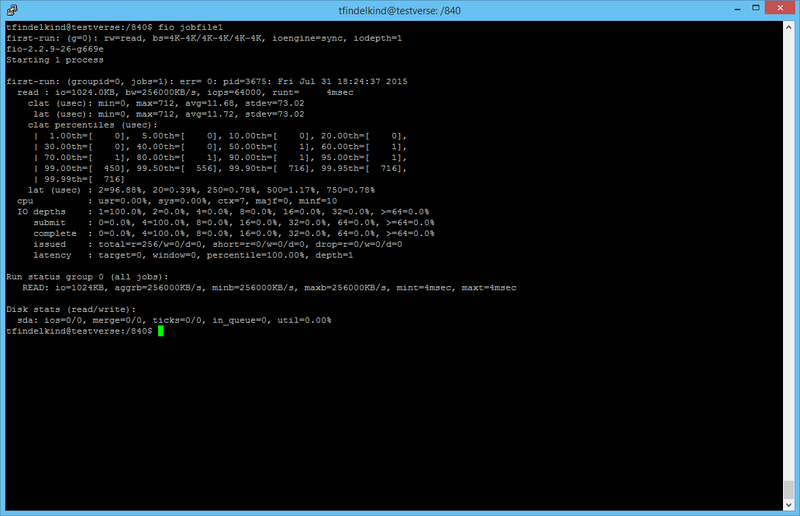 The test could run for ~24h and it will write a lot. I strongly advice that you don´t run the tests yourself as long as you agree that the device looses lifetime. There are some scripts and tools which can be useful to test the device which are based on “fio”. TKperf is a python script which implements the full SNIA PTS specification. With Ubuntu its really easy to install. 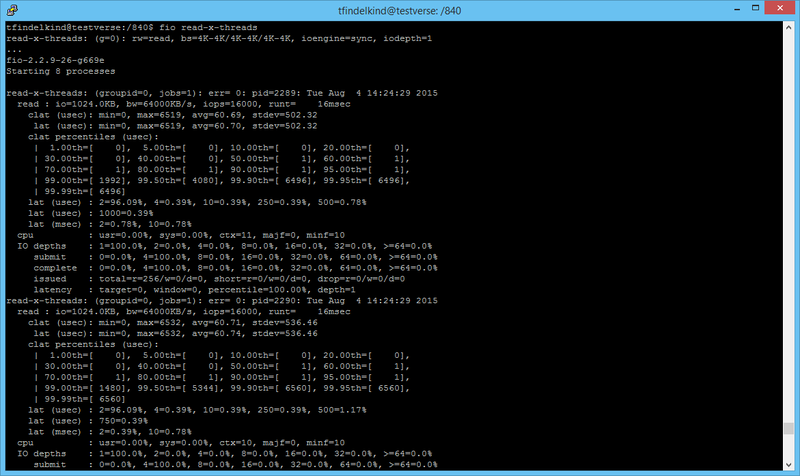 The following command runs all four SNIA PTS tests (IOPS,Latency,Throughput,Write Saturation). I ran with 4 jobs, an iodepth of 16 and used refill buffers to avoid compression of the device. 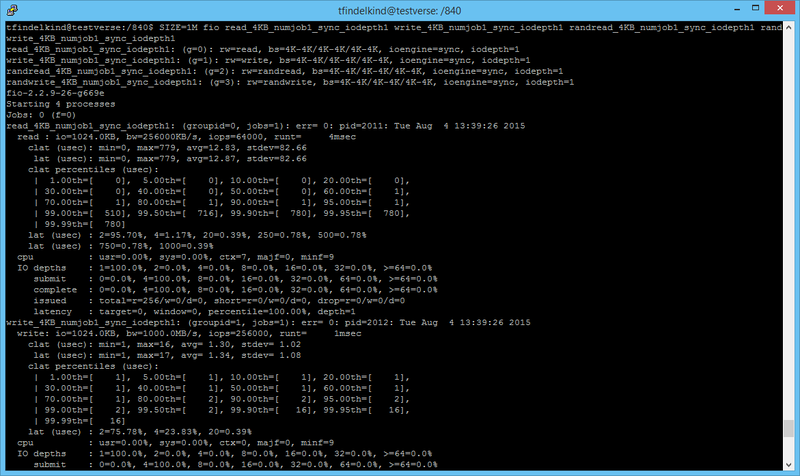 The file test.dsc is a simple text file which describes the drive because “hdparm” can’t get infos about the PX600. REMEMBER: ALL data will be lost and your device looses lifetime or maybe destroyed! tkperf generates some nice png files which summarizes the testing. And the tests reached steady state after 4-5 rounds. The device was formatted with 512 bytes sector size. This was needed to run all tests. It would improve the performance for all bigger block sizes to format the device with 4k sector size! This is the reason why these cards are that nice. Providing < 0,2 ms latency is great! This entry was posted in fio (Flexible IO Tester), Storage Performance, Testverse on August 20, 2015 by admin. 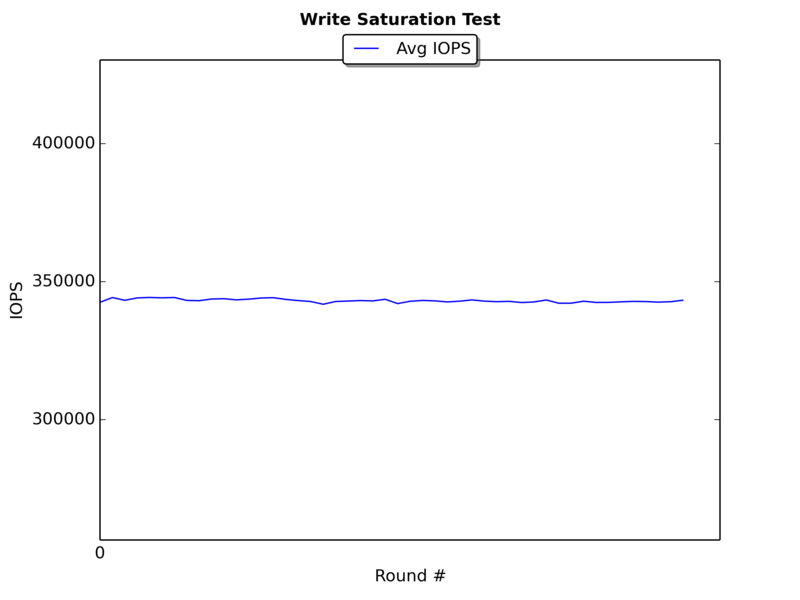 In the last read tests I found that the sequential read IOPS have been higher than expected. I left “invalidate” on default, that means that the used file for the test should be dropped out of the page cache when the test starts. 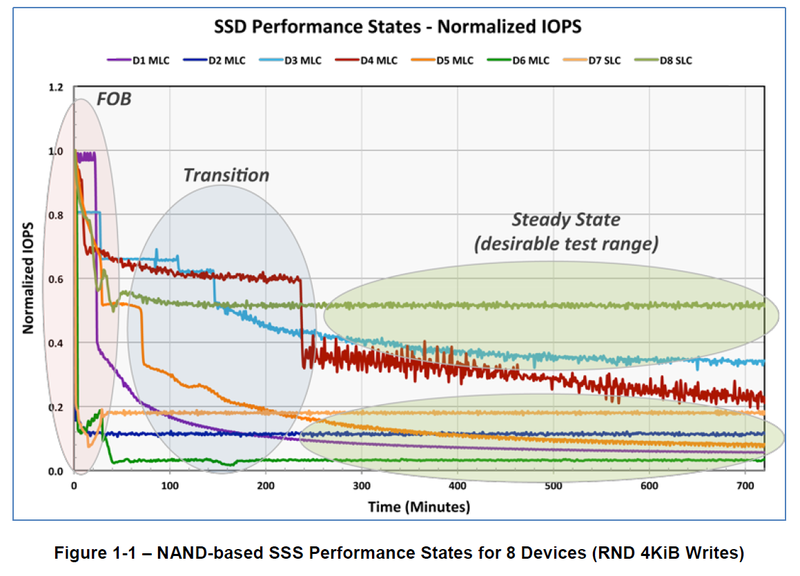 So why are the IOPS higher then the raw device performance? I found that the readahead is responsible for this. Important: readahead will only come into the play when the read is using the page cache. This means “direct=0”. With an output of 4096. Okay the physical block size is 4096 Bytes and not 512 Bytes. 128 (read ahead value) * 4096 Bytes (physical block sector size) = 256KB. This would fit much better with the value of ~182KB. 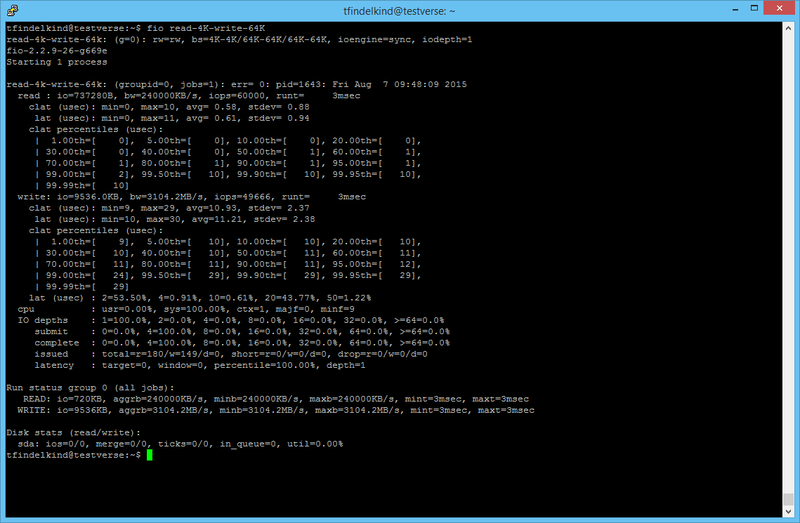 I set the readahead value to 256 and run the same test again. 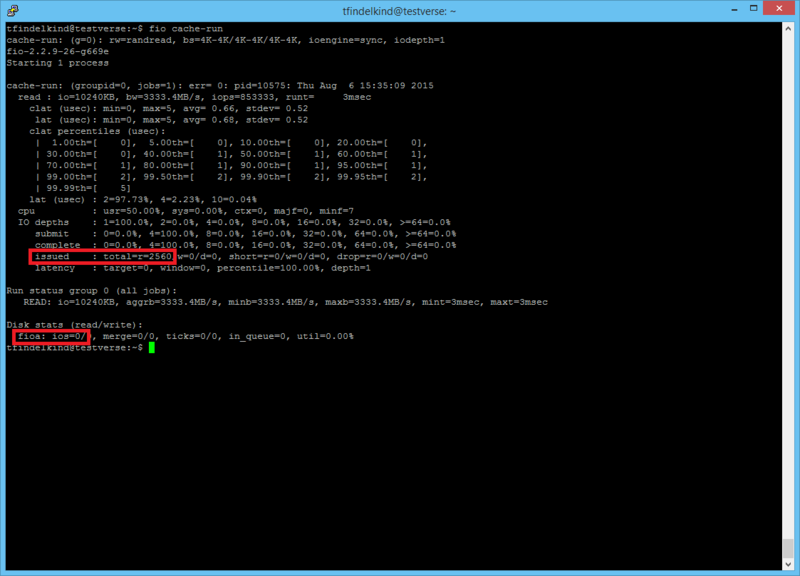 296 IOPS means around the half of the IOPS than the last test. 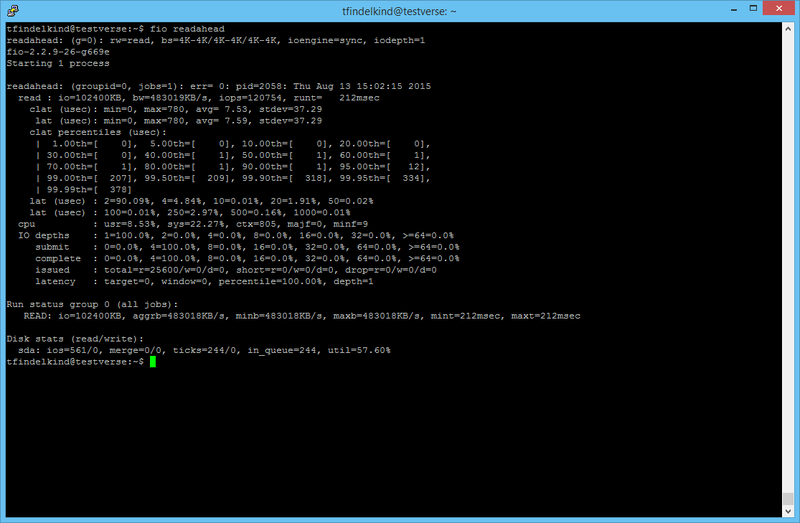 I set the readahead value to 512 and run the same test again. So this value can have an impact on the sequential read performance of your device. But most of the times sequential read are not the bottleneck in a typical environment. 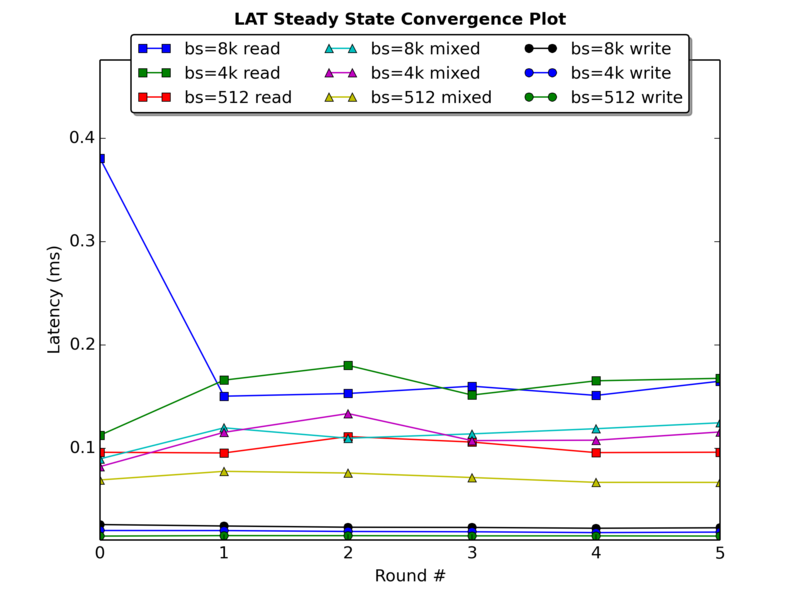 Even HDD’s can provide really fast sequential reads as long the fragmentation is under control. This entry was posted in fio (Flexible IO Tester), Storage Performance, Testverse on August 17, 2015 by admin. FIO (Flexible I/O Tester) Part5 – Direct I/O or buffered (page cache) or raw performance? Before you start to run tests against devices you should know that most operating systems make use of a DRAM caches for IO devices. So for example page cache in Linux which is: “sometimes also called disk cache, is a transparent cache for the pages originating from a secondary storage device such as a hard disk drive (HDD)”. Windows uses a similar but other approach to page cache but for my convenience I will use page cache as synonym for both approaches. Direct I/O means an IO access where you bypass the cache (page cache). If we want to measure the performance of an IO device, should we use these caching techniques or avoid them? I believe it makes sense to run a baseline of your device without the influence of any file system or page cache. The implementation of page caches are different in each OS which means the same device may vary a lot. File systems also introduce a huge variance when running tests. For example: “If someone says that a device with NTFS reaches ~50.000 IOPS/4K” Have you ever asked which version of NTFS? You should have. See Memory changes in NTFS with Windows Server 2012 compared to version 1.0. For sure in a real world workload the influence of a page cache maybe really important and should not be underestimated or uncared. But to measure the raw performance of an device ignore any file system or page cache. “fio” per default invalidates the buffer/page cache for the used files when it starts. I believe this is done to avoid the influence of the page cache when running. But remember, while “fio” is running, the page cache will build up and may have an influence on your test. We need to set the option “invalidate=0” to keep the page/buffer in memory to test with the page cache. The marked parts show that 2560 IO of 4K have been issued. But only 1121 IO hit the device. So 1439 IO seems to be answered via the page cache. So lets run it again because the file should be in page cache now. How to monitor the page cache? The marked part shows a “cache-run”. free -m can give you some details as well. You can run this command to clear the page cache. I ran “free -m” to show the actual state. Then ran 2x the “cache-run” with a size of 1000MB. The second run was MUCH faster. Then “free -m” shows that “used” and “cached” is increased by 1000. 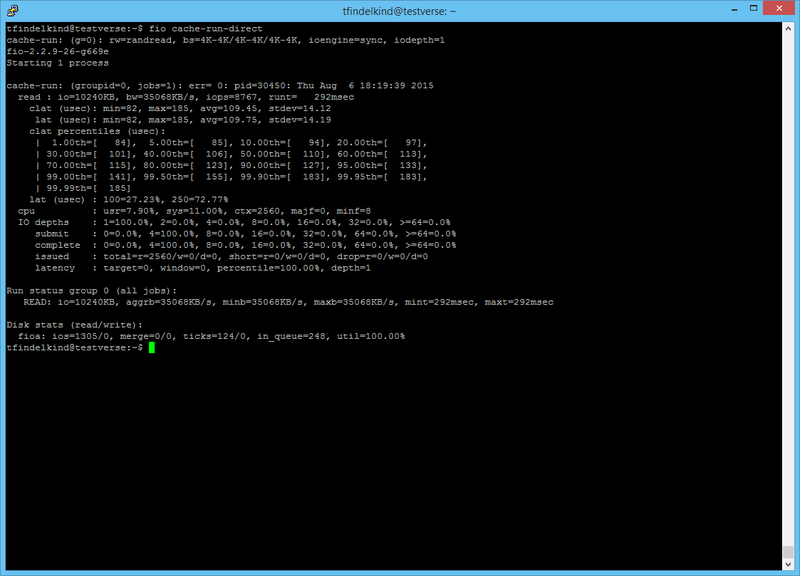 This means the testfile1 is fully cached. 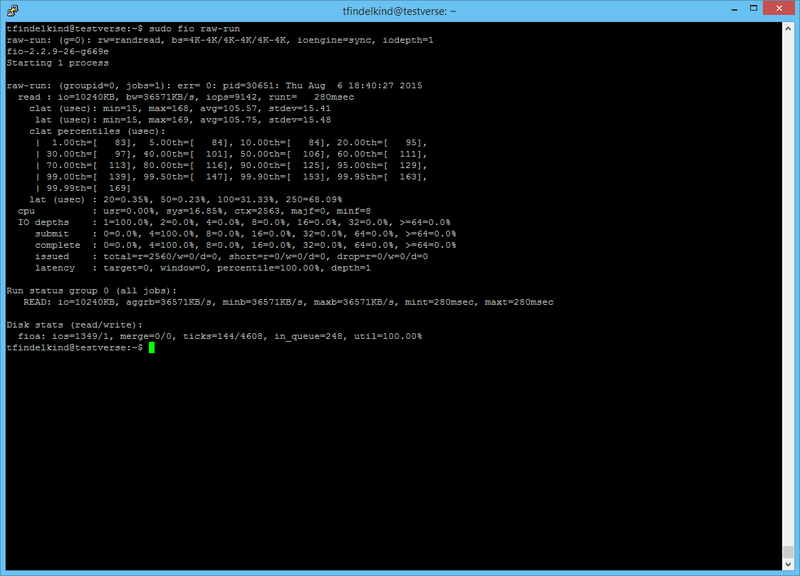 Then I cleared the cache with echo 3 to /proc/sys/vm/drop_caches. “free -m” shows that cached is near zero. This chapter is even more complicated. I will update it soon! Direct I/O means an IO access where you bypass the cache (page cache). You are able to force a direct I/O with the option “direct=1”. Direct I/O is the first step in measuring storage devices raw performance. The IOPS dropped a lot compared to the page cache second run. 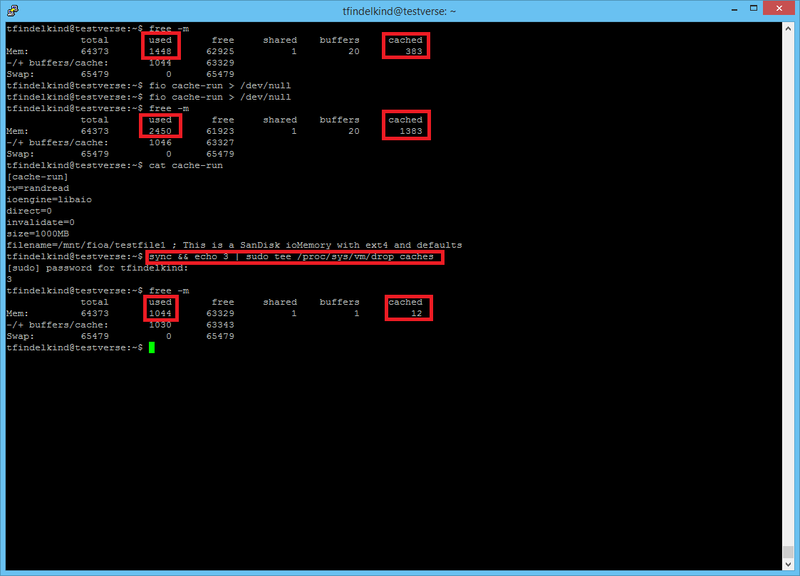 Direct 8767 IOPS vs Buffered 853333 IOPS. 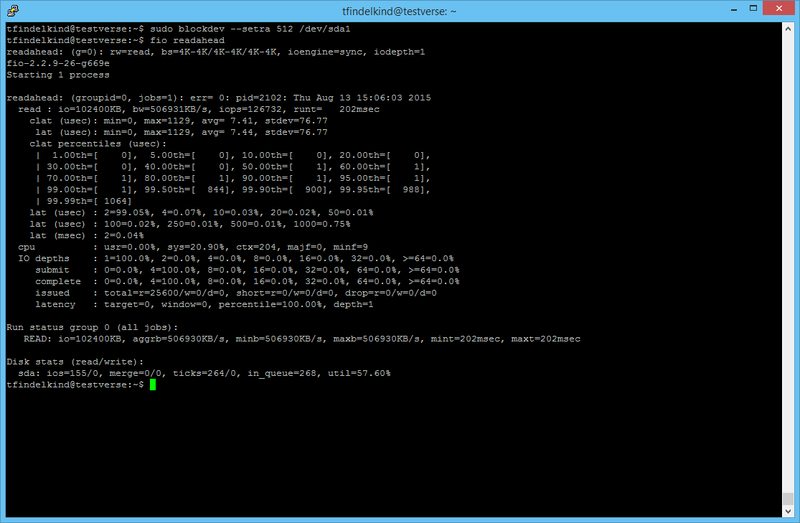 You may think that 8767 are too less IOPS for a SanDisk ioMemory device? Remember this is a random read with 1 job/thread and sync with an iodepth with 1. This means each read IO need to wait that the IO before is completed. RAW performance means you schedule workloads against the native block device without a page cache or a file system. This is the way how most vendors measure their own performance values and present them on their website. The option “filename=/dev/sdb” (Linux) or “filename=\\.\PhysicalDrive1” (Windows) uses the second device of your system. WARNING: The data on the selected device can be lost!!!!! Please double check that you selected the right device. Re-check any files you downloaded. 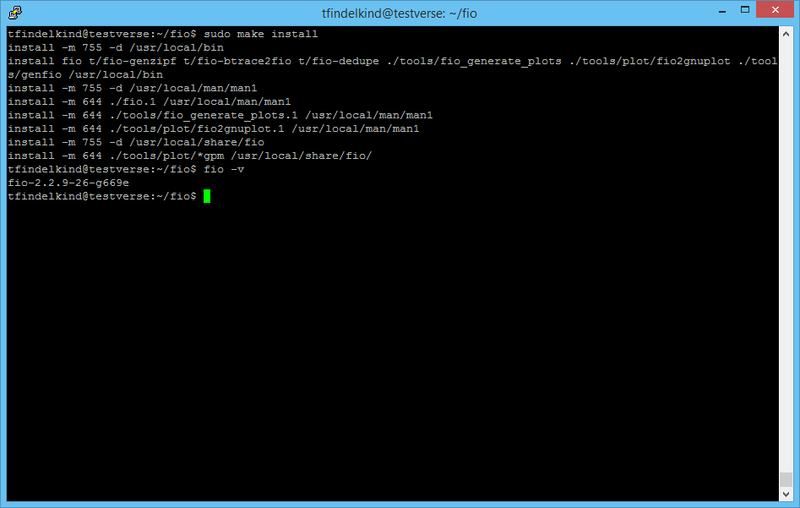 [raw-run] rw=randread ioengine=sync direct=1 size=10MB filename=/dev/fioa ; This is a SanDisk ioMemory. Use /dev/sdb instead? filename=/dev/fioa ; This is a SanDisk ioMemory. Use /dev/sdb instead? 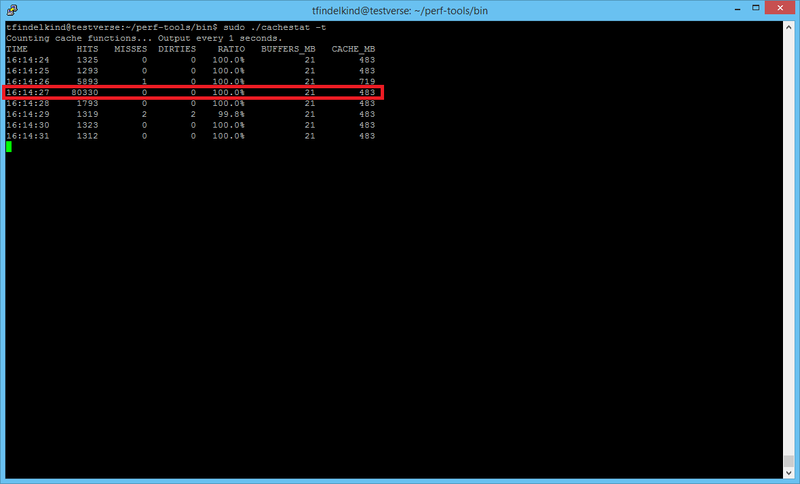 You may noticed that the IOPS slightly increased to 9142 compared to the direct test run. This entry was posted in fio (Flexible IO Tester), Storage Performance, Testverse on August 10, 2015 by admin. 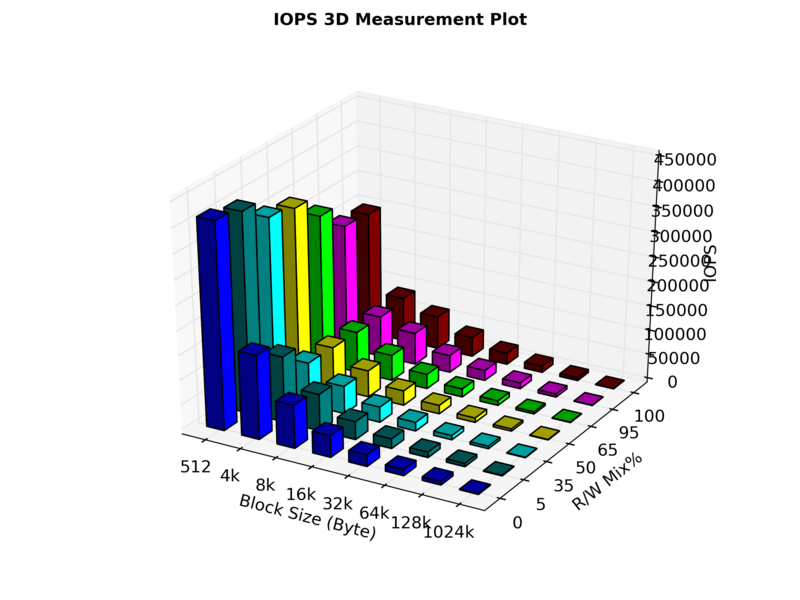 FIO (Flexible I/O Tester) Part4 – fixed, ranges or finer grained block sizes? Using fixed block sizes is the most common way when doing storage (device) tests. There is more then one reason for that. The obvious reason is that a lot of tools only support fixed block size. Another reason is that the storage vendors present their performance counters mostly based on fixed block sizes with 4K. But this doesn’t means it’s the best way to test or measure your storage (device). Raw peak performance means a test where you try to test your storage (device) to achieve the same or similar values as the vendor presents on his website/documentation. This is by nature the highest possible value (peak) without the influence of page caches or file systems. Why should you do this? It is not to make sure the numbers at the vendor website are true or false. It is to make sure the device is running as expected and all best practices have been done. Simulating production workload means a test where you try to test your storage (device) against a workload production. But most of the time you are not able to run the production workload directly on the storage (device). So then you need to simulate the production workload with a tool like “fio”,”sqlio“,”swingbench“… etc. If possible always test with real production workloads instead of simulations. You may used the option “blocksize=4K” or “bs=4K” which is the way to specify a fixed block size of 4K. But the output shows “BS=4K-4K/4K-4K/4K-4K”. So why 6 numbers instead of one? There are three parts ( / is the separator) in the output. The first is related to the block size for reads, the second for writes and the third for discards. 4K-4K means use a block size from the range of 4K to 4K which is exactly 4K. But this gives you an idea that ranges could be used. There is even more then ranges. Block sizes can be fine grained. You are able to specify fixed block size with different values for read,write,discard. Example: Lets run a job with 50% reads and 50% writes. The read should use a fixed block size of 4K but the writes should use 64K. So we need to set the option “rw=readwrite” or “rw=rw” and the option “rwmixread=50” or “rwmixwrite=50”. Instead of using a fixed block size you can specify a range. 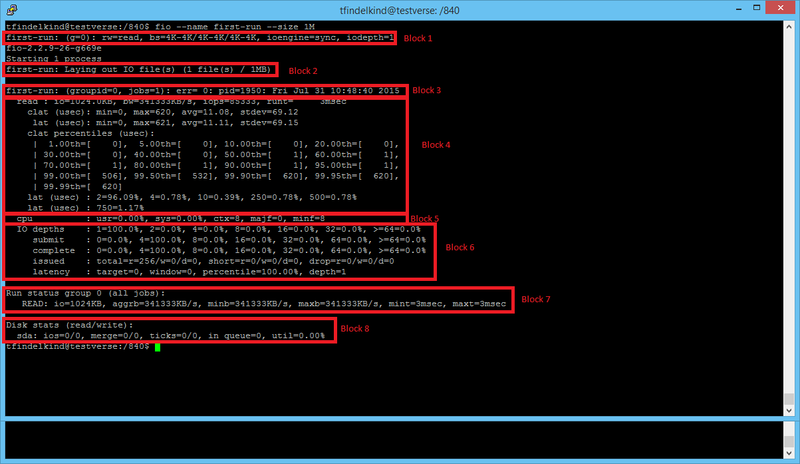 Example: Let’s run a read workload with a block size in the range of 1K to 16K. 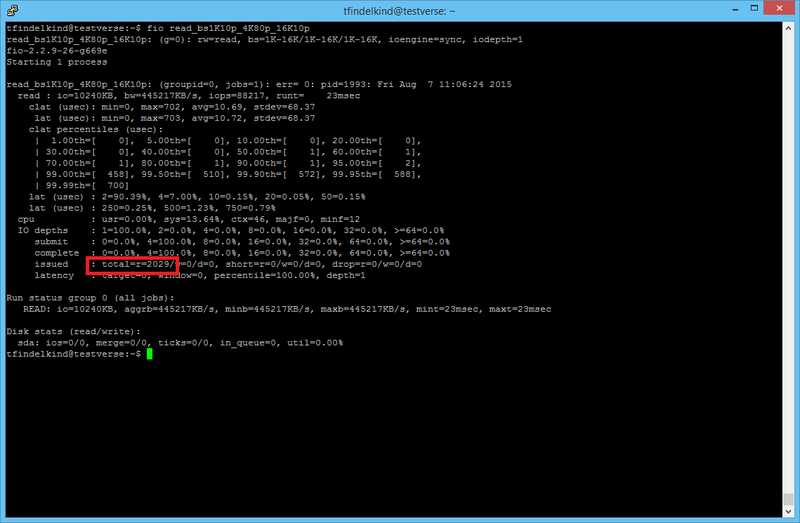 This can be done by set the “blocksize_range=1K:16K” or “bsrange=1K:16K”. But how will the mix look like? fio will mix the issued io block sizes. The issued io unit will always be a multiple of the minimum value given (also see bs_unaligned). Sometimes it maybe useful to control how the weight for a block size within a range should be set. This can be done with the option “bssplit”. What could be the reason why you would like to control the block size? Lets assume you know a production workload and would like to use “fio” to act similar inside a new VM/container to evaluate if the production workload would run fine. for as many block sizes as needed. Example: Let’s run a read workload with a block size 10% 1K, 80% 4k, 10% 16K. This can be done by set the option “bssplit=1K/10:4K/80:16K/10”. This entry was posted in fio (Flexible IO Tester), Storage Performance, Testverse on August 7, 2015 by admin. FIO is able to make us of environment variables and reserved keywords in job files. This can avoid some work so that you don´t need to change the job files each time you call them. So for example this is an entry in the job file where the size should be set via an environment variable. I would like to run four different job files and use for each run a different size (1MB,10MB,100MB,1G,10G,100G). I make use of the default settings under linux. For example I did not specify the block size which is 4K per default, but it is best practice to define them in case a default value may be changed. Yes this could be done in one job file but often you are using predefined files from a vendor or a website like this and just want to call them with your size settings. You can use them in the command line or in the jobs files. They are substituted with the current system values when you run the job. Lets say you would like to run a job with as much threads as online available CPUs. In my case (Testverse) there are 4 CPU cores with Hyper-Threading(HT) on. Means 8 threads. This entry was posted in fio (Flexible IO Tester), Storage Performance, Testverse on August 6, 2015 by admin. First there is an official HOWTO from Jens Axboe. So why I am writing a blog series? Because for someone new to fio it maybe overwhelming. There are good examples of using it but there are no real world output/result and how to interpret them step by step. 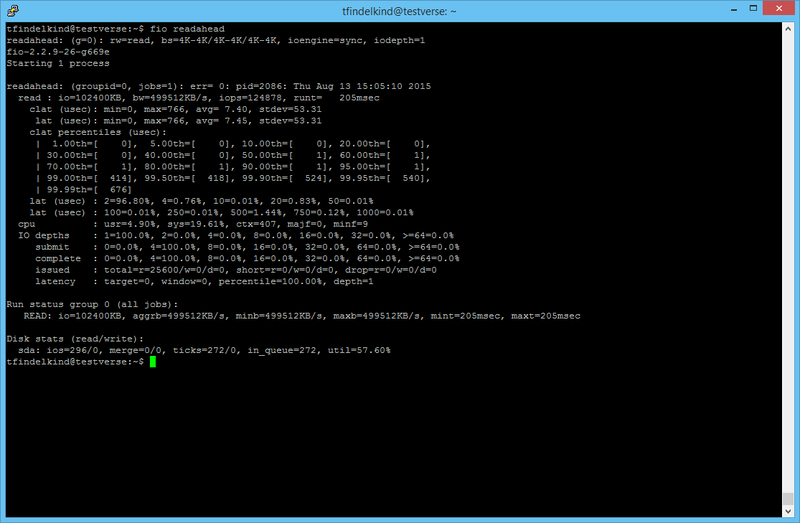 I am working with Testverse on a Samsung 840 at /dev/sda (in my case not root) with ext4 mounted at “/840”. fio runs jobs (workloads) you define. So lets start with the minimum parameters needed because there are a lot. fio ran one job called “first-run”. 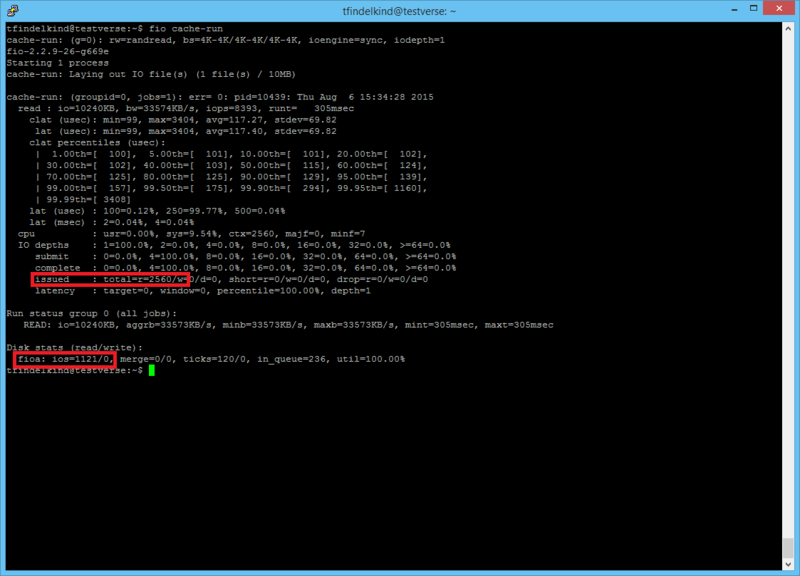 We did not specify what that job should do except that the job should run until 1 MB has been transferred (size=1M). But what data has been transfered to where and how? Don´t get confused. You don´t need to understand the whole output (Block1-Block8) right now. So fio used some default values in this case which can be seen in Block 1. A detailed explanation can be found here. If you don´t want to type in long commands in your terminal every time you call fio I advise you to use job files instead. To avoid interpreting issues with file name and option etc. I call the job files “jobfil1”, “jobfile2″… but it is best practice to give meaningful file names like “read_4k_sync_1numjob”. Job files define the jobs fio should run. How to define a job file with 2 jobs which should run in order? So lets write a file which contains 2 jobs. The first job should read sequential and the second should write sequential 1M. So job1-read will run first and then job2-write will run. How to define a job file with 2 jobs which should run in order with the same workload? This entry was posted in fio (Flexible IO Tester), Storage Performance, Testverse on August 5, 2015 by admin. FIO (Flexible I/O Tester) is a decent I/O test tool which is often used to test the performance of HDD/SSD and PCIe flash drives. But it can do much more. For example did you know that it provides an io-engine to test a CEPH rbd (RADOS block devices) without the need to use the kernel rbd driver? I couldn’t find good documents which shows more interpretations and explanation of the results you receive from “fio”. Voilà, I will do it then. This little tiny tool is so complex that I am planing to split it in different parts. fio is developed by Jens Axboe and available at github. list the help of the command. I am using git for the installation because I like git. 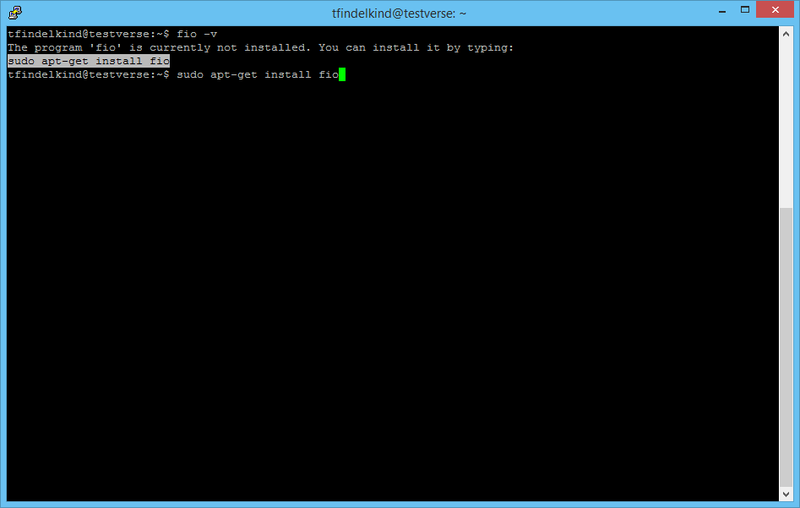 The ./configure showed that some features are using zlib-devel – so thats the reason why we install it. The packages libaio1 and libaio-dev are needed to use the ioengine libaio which ist often used to measure the raw performance of devices. In other distributions you may need to install other packages like make, gcc, libaio etc. in advance.For Ubuntu the “build-essential” should work. This entry was posted in fio (Flexible IO Tester), Storage Performance, Testverse on August 4, 2015 by admin. fio ran one job called “first-run”. 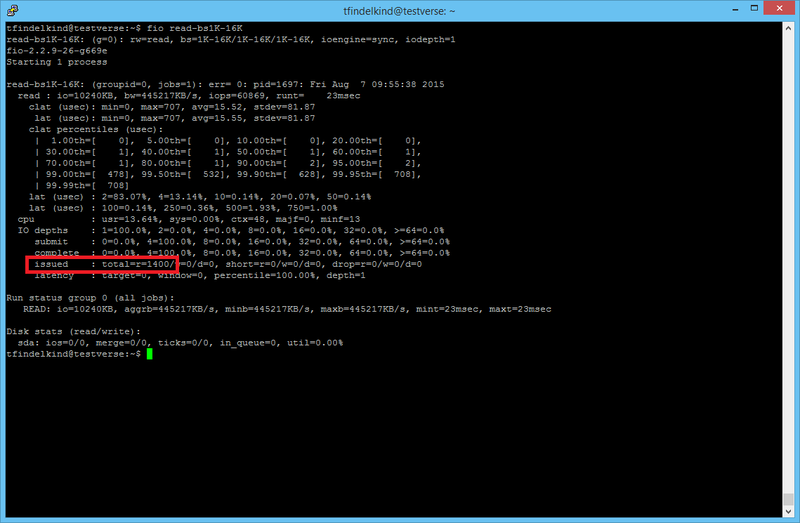 We did not specify what that job should do except that the job should run until 1 MB has been transferred (size=1M). But what data has been transfered to where and how? this job belongs to group 0 – Groups can be used to aggregate job results. This is the IO statistic for the job. is the average IO per second (4k in this case). Actually in this case we only scheduled 256 IOs (1MB / 4KB) to the file. This took only 3 milliseconds. So the value of 85333 does only means that we could achieve these much IO per second if we read for one second. the rest of Block 4 shows in detail the latency distribution. For more details read Part8. this blocks shows the distribution of IO depths over the job lifetime. same like submit but for complete calls. Disks statistics for involved disks but they look strange or? the utilization of the drive -> nothing be done on disk? So what we are seeing here is probably the linux file cache/buffer(page cache) for ext4 files. It seems the blocks are already prefetched. And the linux readahead can have an influence as well. This entry was posted in fio (Flexible IO Tester), Storage Performance, Testverse on August 3, 2015 by admin. But why do I use universe in the name? I learned years ago (feels like ages) that the first step when forming sentential logic statements is to the define your universe. That means a statement can be true or false depending on the environment (universe). Statement I am saying right now: “I am drunken.” which is not true. but the same statement at a Saturday evening with friends at a bar maybe true. So it is important for performance tuning/analysis/testing to clearly define how and in which environment you are testing. If you do so, others are able to repeat the same tests or can compare it to similar environments. This helps to prove your statements or to prove you are wrong. Even if others prove that you are wrong, its good, because then your are able to improve or correct your statement. Remember the 8PP 1.2. The table is based on Ubuntu 14.04.2 server which will be the OS if not mentioned separately in other posts. This entry was posted in Storage Performance, Testverse on August 3, 2015 by admin. I believe that performance tuning/analysis/testing is one of the most complex tasks in the IT world. I read articles from well known IT people who have been known for well founded statements but when they did performance tuning/analysis/testing they have been proven wrong. I am planing a series of performance tuning/analysis/testing posts about storage performance with linux file systems, Docker, MySQL, MS SQL Server and more. So to avoid the common mistakes I searched the INTERNET for some scientific approaches. Andrew Pruski wrote a nice article and Raj Jan wrote a book about this topic. Even this presentation shows the common mistakes. I decided to use these approaches and hopefully provide well founded posts. I added some points to Andrews approach. I will call it 8PP (8 Phases of Performance tuning/analysis/testing) now, because I will often reference this approach. AND Don’t forget: “Performance tuning/analysis/testing is a continues process“. What you consider to be optimal for your workload today may not be optimal tomorrow. I will link a real example showing the 8PP soon. Is the problem/issue based on a real workload? Is the evaluation technique appropriate? is the result statistical correct? has sensitivity analysis been done? 7.1 Form a conclusion if and how the hypothesis achieved the goal or solved the issue! if goal/issue is not achieved/solved, form a new hypothesis. Is there a dependency to something else? The 8PP itself will change from time to time because performance tuning/analysis/testing will evolve. 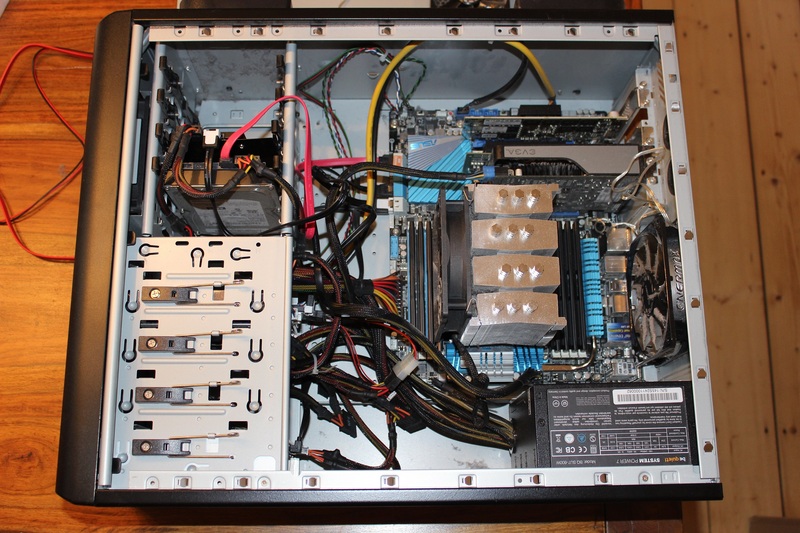 This entry was posted in Storage Performance on July 29, 2015 by admin.